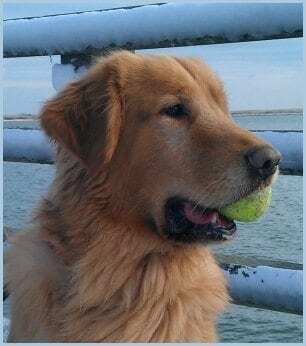 Fitch #4856 - Yankee Golden Retriever Rescue, Inc. Happy New Year from Fitch! Fitch’s owner moved to an apartment that would not allow dogs. Fitch was 4 years old and had been part of his family since he was a puppy. Fitch had been staying at a boarding kennel since the move, but his family could not afford to keep him there and needed a place for him immediately. Fitch was picked up from the boarding kennel and brought directly to our vet hospital. He was neutered and brought back to Riverview to settle in. Fitch was a very sweet, affectionate boy. He got along well with the other dogs and enjoyed playing with them in the play yards. When he spent time in the adoption room, Fitch, like many Goldens, thought he was a lap dog! He loved stuffed toys and tennis balls. If no toy was within reach, Fitch would steal the pillow off the couch and parade around with it. Fitch was such a marshmallow that his previous family reported that the cats bossed him around. The house had also been broken into while Fitch was home and all the evidence pointed to the conclusion that Fitch just welcomed the burglars in and showed them to the silver. He was a pretty typical Golden boy! 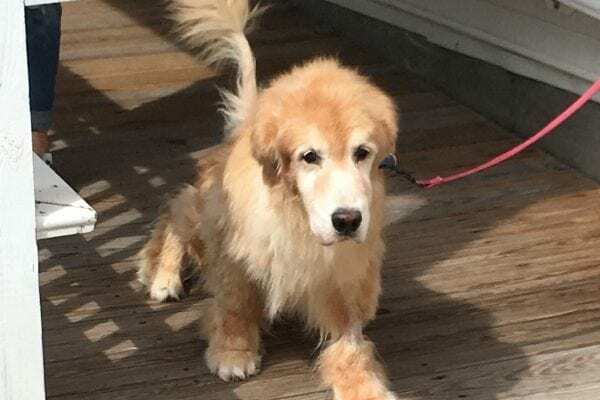 Fitch thrived on attention, so adopters with another Golden and three teenagers were invited to Riverview to meet him. They fell in love with his sweet personality and Fitch was soon on his way to his new home. Fitch’s adopters say that they love spoiling him. He is the center of attention, along with their other Golden, Annie. Fitch has to be in the middle of any family activity. Fitch also loves to go for long walks in the woods or around the neighborhood and come home for a big nap afterwards. Fitch spends very little time alone, and that is just fine with him. He loves to sleep in bed with whatever lucky human he picks for that night. Fitch’s family says that he is a perfect gentleman and is the sweetest, most loving, happiest being on the planet. In fact, Fitch’s family says that the world would be a better place if everyone was more like Fitch! Fitch thanks you for your support. Thanks to you, YGRR is here for dogs like Fitch when their family’s circumstances change. You make it possible for the dogs who need us to get the best veterinary care and to have a wonderful place to stay while we get to know them. Once they are ready to go to a new home, all the dogs are matched to the best adoptive family for them based on their personality and needs. Fitch and all the Rescue Goldens thank you and send big wags and kisses your way for a wonderful New Year!